There's a lot of misinformation online about home laser hair removal devices, so we've created an FAQ page where you can find the answers to all your questions in one place. Does Home Laser Hair Removal Work?Are Home Laser Hair Removal Devices Safe?Is Treatment Painful?What Skin Types does Home Laser Hair Removal Work on?The Fitzpatrick ScaleWhat's the Difference between a Home Laser and Home IPL Machine?How Often Should I Perform Treatments?What are the Possible Side Effects?Are Home Devices Difficult to Use? How Long do Treatments Take?Does Home Laser Hair Removal Work on All Hair Types?Can I shave Between Treatments?How Long Before I see Results?Can Both Men and Women use Home Laser Hair Removal Devices?Can I do Home Laser Hair Removal if I'm Tanned?Can I Treat the Upper Lip Area with a Home Laser? Based on a sizeable volume of scientific studies that looked at the efficacy of home laser / IPL hair removal devices, the answer is that they do work to a certain degree. ​To learn more about this in detail, you may want to check out our post: "The truth about home laser hair removal"
They don't work for everyone. In fact, laser hair removal in general (with professionally done or not) doesn't work for everyone. For people that fit the correct profile, the chances are very good that it will work, though. Results aren't as impressive as the lasers used by professionals. Less impressive means less hair reduction and less permanence after the treatment ends. For some people they work really well - scientists don't yet fully understand why laser hair removal works really well for some people and not for others. Some studies have shown complete hair removal up to 12 months after the final treatment. Consistent use - Studies show that the best results are obtained through consistent use of the device. Typically, in such studies, patients performed laser hair removal on themselves every two weeks. During these times, hair reduction reached up to 70%. 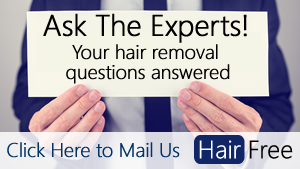 Hair regrowth occurred usually more than one month after the last treatment performed. Are Home Laser Hair Removal Devices Safe? In our the truth about home laser hair removal article, we looked at a number of scientific studies all concluding that home laser kits are safe for use. In order to ensure safety, we recommend that you only purchase products that have been FDA approved. ​The two most popular FDA approved devices on the market are the Silk'n SensEpil and the Tria 4X. Solid surface detector - ​They won't emit light unless the unit is pressed up against a hard surface in order to prevent eye damage from looking directly at the light. There is a certain level of discomfort during treatment, however in a recent study all patients described the feeling of treatment as being at least "tolerable". Some people describe the feeling of a slight burn and that it feels like an elastic band being hit against the skin repetitively. Home laser hair removal devices typically operate at a fluence (power setting) of less than 20 J/cm (2) whereas lasers that ​are used professionally have a lot more power at their disposal. A recent study showed that the lower the fluence setting, the less discomfort. This is why home laser hair removal treatments cause less discomfort than professional laser hair removal. What Skin Types does Home Laser Hair Removal Work on? Home laser hair removal kits are only good for skin types I - IV on the Fitzpatrick scale. People with darker skin than IV will either need to consider professional laser hair removal with the Nd:YAG laser or electrolysis. What's the Difference between a Home Laser and Home IPL Machine? In terms of efficacy and safety, there haven't been any conclusive studies that have shown one type to be better for hair removal purposes than the other. There is, however, a difference in the underlying technology and how these devices work. Home laser hair removal machines use a diode laser that operates at specific wavelength whereas IPL machines apply pulses of light at different wavelengths (you can consider it as being like a shotgun approach to hair removal). How Often Should I Perform Treatments? Manufacturers provide specific guidelines regarding the regularity of treatments. In most instances, you should apply treatment bi-weekly. "Schedule your first 3 - 4 sessions are two weeks apart. The following three sessions should be approximately 4 weeks apart and thereafter you should use the product if and when needed until long-term results are achieved." Side effects are less than professional laser hair removal due to the lower power ratings of the home devices. Are Home Devices Difficult to Use? It's a difficult question to answer because it depends on both the size of the treatment area and the device that's being used. Some devices, such as the Silk'n Flash and Go have been specifically designed for smaller treatment areas. The head size is much smaller and it allows the patient to achieve accuracy that would be required for treating areas such as the bikini area. "The time can vary depending on the area of the body treated. A two full legs can take up to 30 minutes, or two underarms could take less than 10 minutes. Since the device runs on regular electric power it can be used for as long as needed to complete a full treatment of the desired area(s) for hair removal." Does Home Laser Hair Removal Work on All Hair Types? Laser hair removal (whether done professionally or at home) only works on hairs that contain melanin. White, blonde and grey hairs don't contain enough melanin for the laser to target and therefore the treatment is ineffective. Yes, you can shave the treatment area between treatments however, for best results, we recommend that you don't do any form of waxing. As you can see, patients saw a 21% reduction after week 1, 38% after week 2 and 58% after week 3. In this particular study, patients self administered laser hair removal treatments each week for 8 weeks. Can Both Men and Women use Home Laser Hair Removal Devices? Yes.​ In some instance, like chest hair on men, hairs are more resilient so more sessions are required. However, in terms of safety and efficacy, home lasers can be used successfully by both men and women. Can I do Home Laser Hair Removal if I'm Tanned? If you've had recent exposure to sunlight and are tanned as a result then it's highly recommended that you don't do home laser hair removal. Can I Treat the Upper Lip Area with a Home Laser? You can however you should take precautions to make sure that your lips aren't exposed to the light from the laser device. Lips contain a large amount of melanin and if not covered during treatment can be burnt from the laser. We recommend that you cover your lips with white surgical tape to ensure they aren't affected by the laser. Pretty cut to the chase question. The affects from the suns natural uv rays are known pretty much to anyone under the sun…no pun intended. I was wandering (that is if the laser light is the same/similar to our sun), if the removers light can give off the same harmful cancer causing damage? Ive been using silk n go for a month now, and although i will continue the use in order to rid myself of an unsightly mustache ive been sporting since jr. High, it will be good info to pass on to others. In short:- There aren’t any scientific studies/documented cases linking laser hair removal to cancer. Thanks Paul, this is really helpful. It covers a lot of areas of concern.